Memorial To Dr Anthony Peat. 1881. Slender obelisk of polished Dalbeattie granite,rising from a tapered pedestal on a stepped base. The monument is set within a shallow railed enclosure, and rises 23 feet from the ground. The obelisk shaft is 13 feet high. 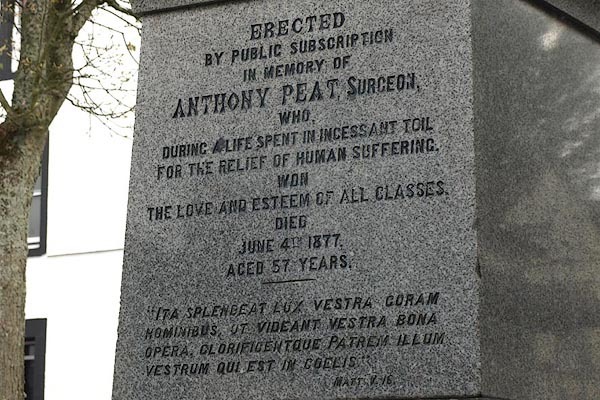 An inscription at the base of the monument reads "ERECTED BY PUBLIC SUBSCRIPTION IN MEMORY OF ANTHONY PEAT, SURGEON, WHO, DURING A LIFE SPENT INCESSANT TOIL FOR THE RELIEF OF HUMAN SUFFERING, WON THE LOVE AND ESTEEM OF ALL CLASSES. DIED JUNE 4TH 1877 AGED 57 YEARS." 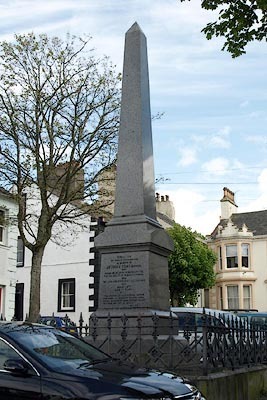 Below this, a quotation in Latin from St Matthew's Gospel, which in translation reads " EVEN SO LET YOUR LIGHT SHINE BEFORE MEN, THAT THEY MAY SEE YOUR GOOD WORKS, AND GLORIFY YOUR FATHER WHICH IS IN HEAVEN"
A prominent public monument at the centre of a formally-planned urban square which commemorates a notable C19 Workington physician held in high esteem by the community he served for over 30 years.